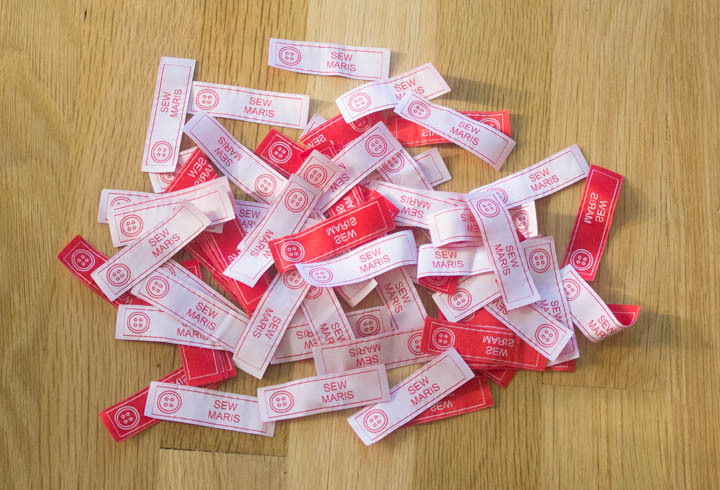 …well, they are not for everyone. I have tried them in the past. I have written lists of them. I have even reviewed them. Once, possibly twice throughout the year. Why have I given up writing sewing resolutions? Because even though teaching sewing is currently my profession, sewing is not work for me. Sewing is my joy. Sewing is my creative energy. It is how I express my love for my friends and family members. A custom-made shirt. A just-right twirly skirt. A law-office-appropriate knit dress. Well, Italy for a few weeks in September. And then Amsterdam for a few days. Finally, back to Bellevue by the end of September. …it was off to Camp Huston for my annual fall ASG sewing retreat. Nearly didn’t comeback from this relaxing, inspiring, invigorating time with my sewing sisters. And then there was my overly-crazy Kids (weekend) Sew Camp schedule. 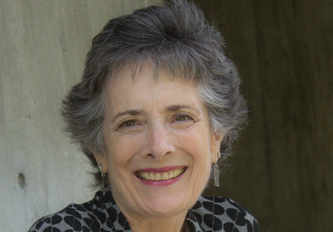 And the fall ASG educational event with the uh-mazing Gail Yellen on October 17th and 18th. Heaven! I’m back. More soon. I promise!! 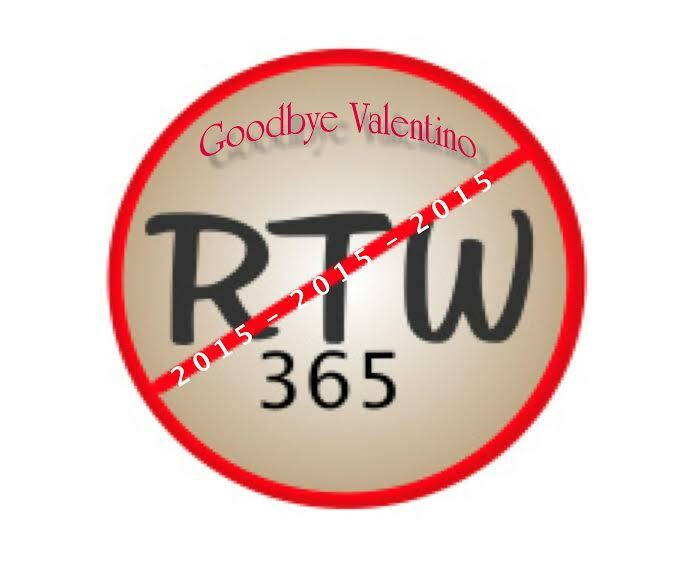 You have probably heard of Goodbye Valentino’s RTW Fast. Cuz you are just cool like that. For 2015, I am all in. Gonna officially take the plunge. I don’t know about all you other RTW Faster-types, but I definitely have some exclusions. Shoes. I have enough tools and mess in my house with all my sewing paraphernalia, and I sure don’t need to learn cobblering. Only.So.Much.Time.Remaining! Sweaters. KnitNBee, I bow to you, and the many other great knitters out there. I know how to knit, but don’t do much of it anymore. I already have enough arthritis in my hands to cause discomfort, and I need to save my hand energy for sewing and gardening. On that note, I am starting to think about which varieties of edible greens I should plant in the next month or two…we have had a mild winter here in the PNW. Gardening time! 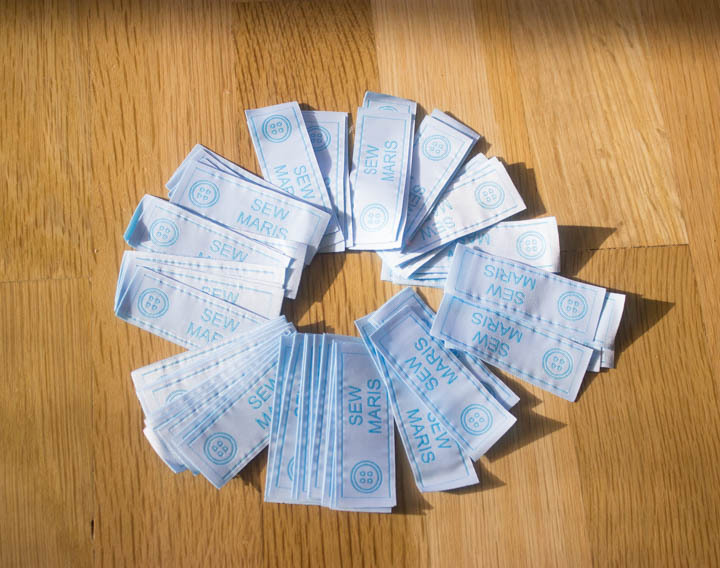 Quick Tip Tuesday: Sew something FUN! I am not making a big pile of 2015 resolutions, but I am spending some time this month thinking about my business and personal priorities. I am not ready to share everything yet, but one thing is super clear: I will be sewing more for FUN this year. Making things that just tickle my fancy, and I encourage you to do more of the same. How ’bout it? What do you want to sew, just because? Not necessarily for any good reason, other than bringing you joy. Oh. I think that IS a mighty good reason! I overcommitted myself this summer. Too many sew camps. Too many private lessons. Too.Much.Everything. Is this the curse of creative spirits? An innate inability to say NO? Or is it just me? I have always been the kind of person who thinks that if a little is good, more has got to be better, right? Well, not always, I guess. I love getting new students turned on to sewing. It is hard for me to say no, because I know the options are limited for people to learn how to sew, and particularly, to sew well. But I have not been able to pursue some new creative endeavors this summer, and I am frustrated by my lack of time/energy for some of these new things. Also not enough time for SEWING. Which is what we are all about around here, right? So, all that to say SORRY for some radio silence around here. I miss you, dear readers. Part of my silence of course was my $#*^#$ hard drive failure. And part of it was exhaustiona bit of overwhelmed-ness. If that is even a word. So, do tell. What have you been sewing? I have been irritated by those little lumps of lead pellet/pattern weights I bought at Joann’s. You know the ones—a package of 4 made by Dritz. The seams have started opening up, and those little pellets fall out and roll around the sewing studio. That is kind of a safety hazard, not to mention annoying. So I have been wanting to mimic a different size/shape of pattern weights that a good friend of mine bought ages ago, and I can’t seem to find them anywhere. She called them wiggle weights. 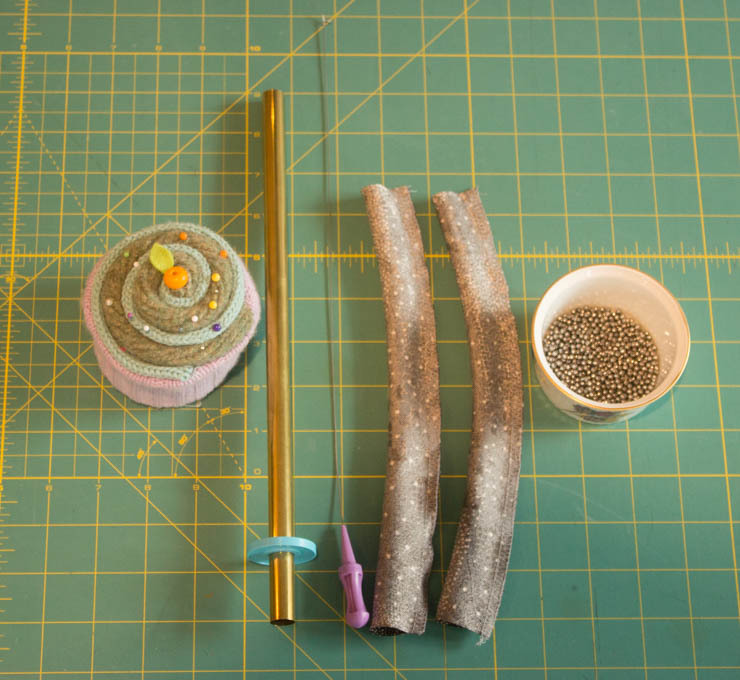 Here’s how I made these little Seattle-slug-o-pattern weights. Serge into a tube, and turn right side out with your handy Fasttube turners. Cut into 8 or 9 inch pieces. 5. Fill with lead pellets or something heavy. Or get some cute kids to do it for you. Sometimes a chunk of a plastic straw might be helpful. 6. Secure the other end. Ta-da! 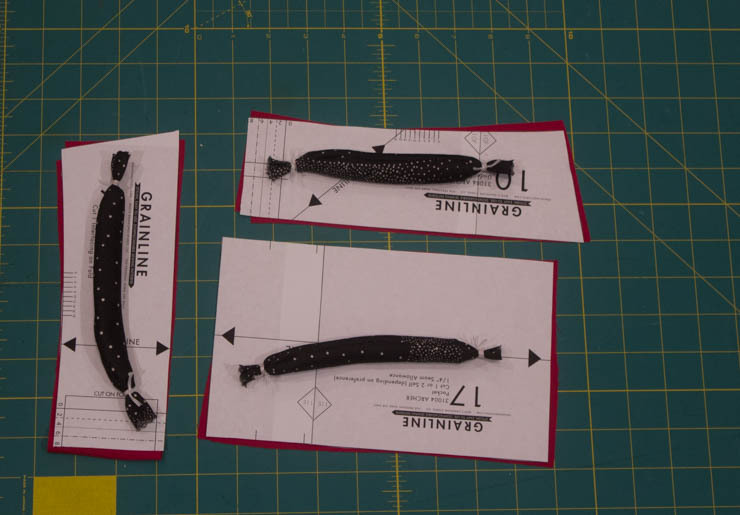 Plop these little guys down on your pattern pieces and get to cutting. I don’t know that my system will hold up any better than the purchased ones, but I am giving it a try anyway. Oh, and I used home dec weight fabric to increase the sturdiness factor. You could also interface. Some people never change their sewing machine needles unless they break. Do.Not.Be.That.Person. You paid good money for your fabric, and a dull needle can damage it. How happy are you going to be when stitching up the final seam on your uh-mazing new dress, and BAM!—the needle punches a big hole or causes a run in your fabric? 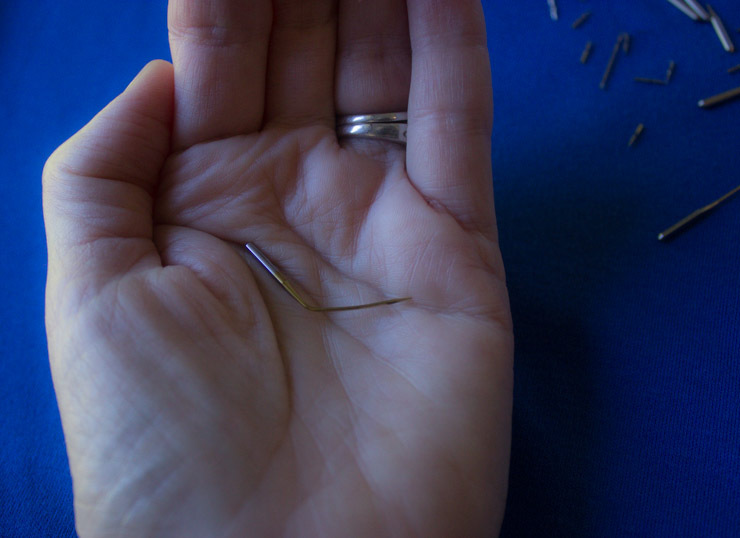 Sewing machine needles have a life span, and it is rather a short one at that! Eight hours, people. Eight hours of stitching time, max. Personally, I think it is a little tough to track hours of stitching time. It is easier to change the needle every project, or every other project if you are doing something quick. At a minimum you are saving yourself skipped stitches, and potentially much bigger problems. And since most needles cost less than a dollar, really, what’s your hangup with throwing away a needle, anyway? Now, let’s get down to it. You need to know a few needle facts. Let’s cover the basics first. There is a wide selection of needle types. You need to select the type of needle that is appropriate to do the job.You wouldn’t build a cabinet using a sledge hammer, and the same principle of fitting the appropriate needle to the task applies. Made especially for sewing knit fabrics. The rounded tip of the needle “pushes” the knitted fibers apart so the point does not break the fibers and cause a “run” or “ladders”; same concept as getting a “run” in your pantyhose (does anyone wear pantyhose anymore?). Duh. 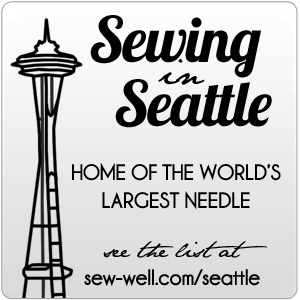 Just like the name implies, this needle is for denim. And it also works for any densely woven materials such as imitation leather or home dec fabrics. This is a very strong + sharp needle. This “specialty” needle is often used for embroidery and topstitching with decorative threads. It has two eyes so you can try sewing with 2 different colors of thread. 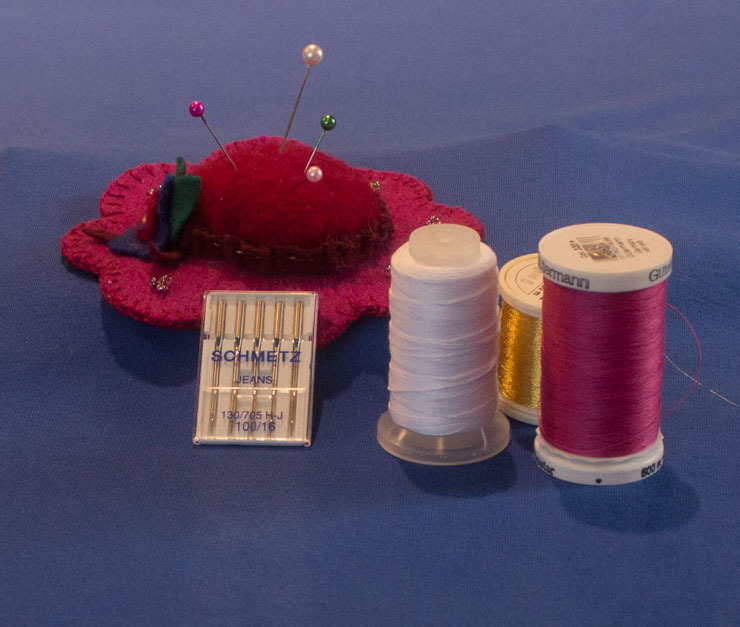 These specialty needles were designed for producing a RTW-looking hem, but can also be used for decorative topstitching. Since there are 2 needles on a single shaft, this needle produces 2 rows of parallel stitches at the same time. 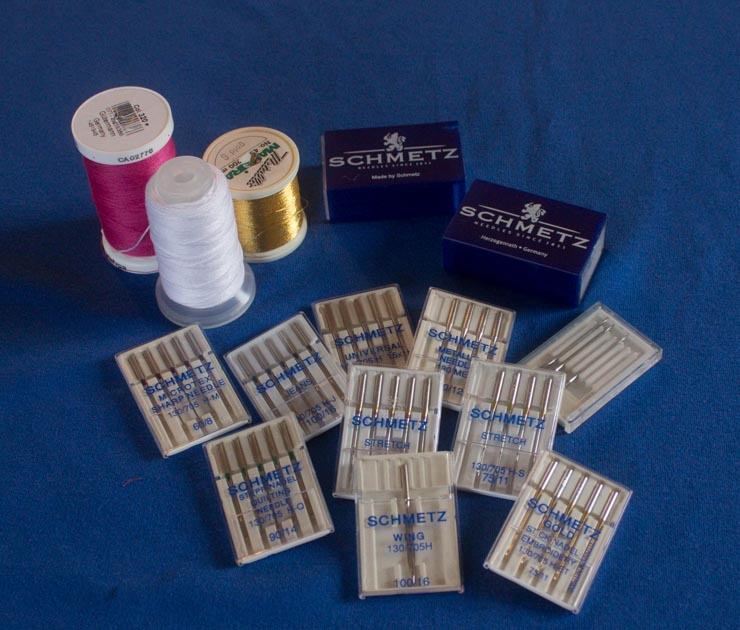 There are double Universal, Denim, Machine Embroidery, Metallic, and Stretch needles available. One caution: the distance between the two needles varies, so be sure to select a needle that will fit into the hole in your presser foot as well as the hole in the stitch plate of your machine. In addition to a long smooth groove and a large eye, embroidery needles also have a special “scarf” on the back of the needle. All of these characteristics help protect the fragile specialty embroidery threads by guarding against excess friction. Similar to an embroidery needle, but with a special Titanium Nitride ceramic coating. This helps improve needle wear resistance in high stitch count applications and penetration of coarse or densely woven materials. A specialty needle, also known as a “wing” needle, that creates decorative openwork or cut-work on tightly woven fabrics. Duh. These needles have a darn sharp cutting point that is needed for leather and imitation leather. Have you ever tried sewing metallic threads without this needle? A “must have”for sewing with metallic and other specialty threads because the elongated eye prevents shredding and breaking of metallic threads. Made especially for piecing and machine quilting, the thin tapered design of these needles allows them to pass through many layers smoothly to help eliminate skipped stitches and keep stitches even. This specialty needle can be helpful for children, those with vision problems, or those with fine motor coordination issues resulting from arthritis or other conditions. NOT to be confused with a ball point/jersey needle designed for knits! These needles are made especially for synthetic suede or highly elastic synthetic knit wear. Great for stitching through elastic because of a special coating that prevents “loops” from pulling out of the elastic. 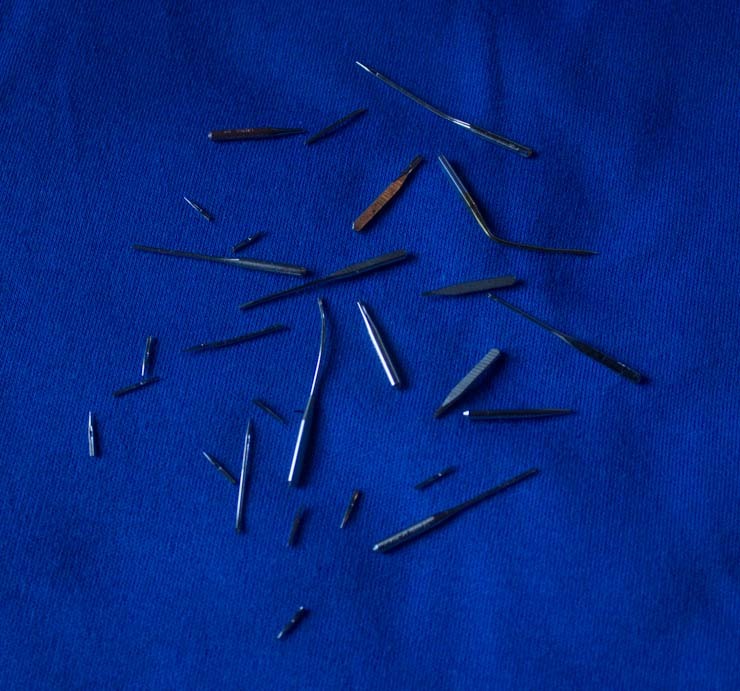 These needles have an extra large eye and large grooves to accommodate the heavier weight of topstitch/denim/buttonhole twist threads. This is your basic workhorse. A general purpose needle that can be used on knit or woven fabrics. It has is great for zigzag stitching, does not damage knits, and is still sharp enough to go through a lot of different types of fabrics. Because of the slight ball point it is not ideal for going through many layers or high thread count fabrics. Alright, friends. Now that you have the basic facts about needles, how do you choose the right needle for the job? There is a little science and a little art involved in this. The 2 factors that control your decision are the type of fabric and the weight of the thread. For example, cotton lawn or voile is lightweight fabric, so you know right away you want a small needle. It is a natural fiber, so probably a universal tip is best. Microtex is not required because lawn is not a tight weave, and Ballpoint/Jersey is out because it is not a knit. I would start with a Universal 8/60, and because this small needle has a correspondingly smaller groove in the front and a smaller eye, I would also choose a lighter weight thread. Something like a 50 wt cotton. The thread you select should not occupy more than 40% of the eye of the needle. That is a little-known fact you can toss out at your next cocktail party conversation to look all witty and smart (or maybe just all-sewing-geeky-like! 🙂 ). If I was sewing a rayon/lycra Ponte weight dress, I would start with a Ballpoint/Jersey size 70 or 80—depending on the weight of the Ponte. I would also use a standard 40 wt polyester thread. The art part of the proper needle selection means you need to experiment a little. Better to do this on scrap fabric rather than your actual garment, BTW. 😉 Sometimes it seems like a size 80 will be perfect, but on your sewing machine the stitches look better with a size 70. after a while you will learn what works best for your machine and your fabrics, but it never hurts to run a few tests to see how things look. 1. I love the feel of fabric. I am very tactile, and I have always loved touching and petting nice fabric. Still do! 2. When I was growing up, all my female role models sewed. My beautiful mother was an excellent seamstress, and both my grandmothers and aunts were pretty darn handy with a needle. I am aware not all women in that time period liked to sew, but most had at least been taught the basics at school or from a family member. 3. Home Economics was required in school, and sewing was part of the curriculum. I remember (and am FB friends!) with my first Home Ec teacher other than my mom: Mrs. Hoover. I am sorry to say I thought I knew more than she did because I had already been sewing for several years with my oh-so-perfectionist mother. I am still embarrassed when I think of my attitude toward this wonderful woman. She had graduated from WSU with a degree in Home Economics, and I still remember her tremendous patience teaching a room full of 7th grade girls to sew. Sheesh! Only a 13 year-old could be so sure she knew more than a college graduate! I’m sorry, Helen!! 4. The process of taking flat fabric and patterns and turning them into 3-dimensional articles of clothing seemed magical to me. Still does! 5. I have never had any interest in trying to manufacture my own clothing designs, but I always wanted to wear clothes that were uniquely ME. Colors I liked. Fabrics that I enjoyed wearing. Design lines that were both functional and pretty to my aesthetic sense. Still do! 6. Fit. I grew up wearing clothes that were custom fit to my size and shape. Why would you settle for something off the rack that wasn’t “just right” when it was easy enough to “make it so”. I see friends of mine exclaiming over the “great fit” of their RTW garments, and most of the time I manage to keep my mouth shut. Most of the time. 😉 OK, occasionally. 7. I love the process of sewing. It is a challenge to sew. You have to “think it through” and keep your brain engaged pretty much the whole time. Forget auto-pilot; ain’t gonna work out for you. 8. Sewing beats the pants off watching TV. Except for possibly Downton Abbey. Even as a kid I really never cared much for TV, and now even less so. When I do watch TV these days I am usually knitting or sewing at the same time, with only partial attention to the tube. 9. I get to sew adorable clothes for my adorable grand-daughter! 10. Being part of the local and national sewing community has enriched my life beyond even my extremely fertile imagination. So many friends, so much support, and so much darn good fun. 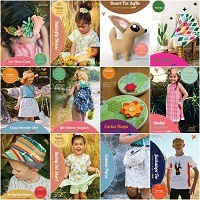 Y’all know that ASG is my favorite sewing organization, and the online community has expanded my connections around the globe. What could be cooler? 11. Now I get to pass the joy and skill of sewing on to others. No matter how tired, stressed out, or anxious I might be, when I see one of my students light up with pride at their accomplishments, I wouldn’t trade that moment for anything. Not even Extreme Moosetracks ice cream. For reals! 13. I love creating, and sewing is my favorite medium. It engages my brain, tickles my design sense, and gives me a big ole endorphin-rush of happiness. How about you? Why do you sew? p.s. For another creative blogger story, be sure to read Stephanie’s story of “Why I Create” . 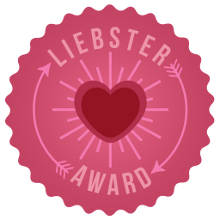 The Liebster Award – Me? Well, color me surprised! And super appreciative! 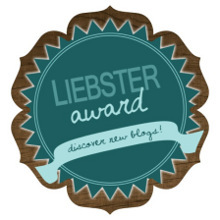 Thanks Deanna, (of the awesome blog, SewMcCool), for nominating me for a Liebster award. You have probably heard of this award- it is handed out to new bloggers and/or those who have a small following. So here’s your chance to follow me and show me some reader love! I will reciprocate with loads of pithy, entertaining, and hopefully useful blogging posts about sewing. And occasionally other topics. But almost exclusively sewing. Deal? I get to answer a few of Deanna’s questions, and then nominate other “new” or “new-ish” bloggers for Liebsters to pass on the love. Here we go! 1. When did you begin sewing, and why? 2. 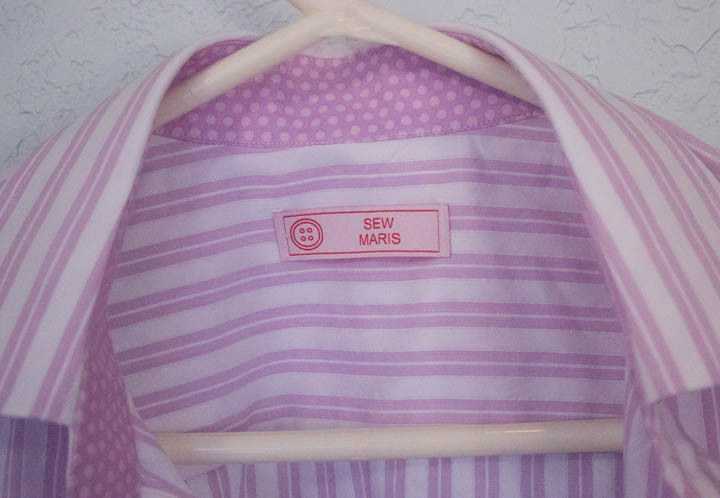 When did you decide to “take up” sewing professionally? What was the catalyst? I dreamed of having some kind of sewing business my whole life, but I “fell into” working as a computer programmer and then a program manager soon after college. The real catalyst was getting laid off from a part-time job I had accepted right after leaving Microsoft. I thought, “this is my chance to see if I can do something with sewing”. I really was not sure where a sewing business would take me, but I had an idea that private sewing lessons might be appealing to already-over-scheduled-women. Soooo, with my husband’s blessing and support, I filed for a business license, created a web site promoting private sewing lessons, and began teaching group lessons at a nearby fabric store. Business was very slow at the beginning, but I was learning and trying new things as I went along. 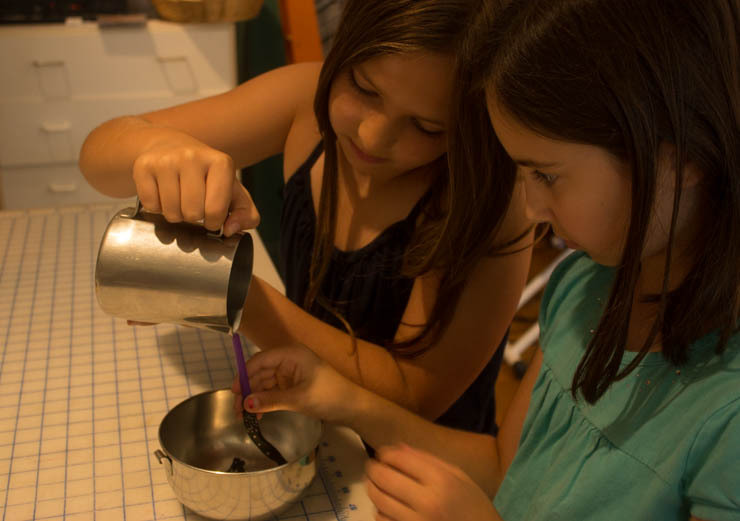 Two years ago one of my students encouraged me to try a sewing camp for kids, and I am pretty sure I had as much fun as the girls did that first session. I have totally realized my passion – imparting the love of sewing to other people! 3. Which is more important to you – if you could have only one or the other – color or design? Why? Tough question, because I do love color. But design would be my first choice because beautiful color will not overcome poor design, but black or white + great design = art. 4. If you could sew for any person, living or historical, who would it be, and why? I would LOVE to sew for Michelle Obama because she has such a great sense of style and has fun with her clothes. Grace Kelly would be an awesome person to dress/sew for too – such a classic beauty and wonderful taste in clothes. 5. Share 5 things about yourself that most people don’t know. I am afraid of heights AND snakes. I took voice lessons even though my mother told me I was tone deaf (and I’m not, BTW). Despite my fear of heights, I went paragliding in Mexico, zip-lining in Hawaii, and walked across the Capilano Suspension Bridge in British Columbia. My head circumference is too big to wear most hats. Those “one size fits all” hats should state “except Maris”. I was born in France while my dad was serving in the Air Force. What do you most like to sew, and why? What makes you want to jump out of bed every morning? What were your favorite 3 activities when you were a child? Which is more important to you – if you could have only one or the other – color or design? Why? Share 5 things about yourself that most people don’t know. What quality in a friend is most important to you, and why? 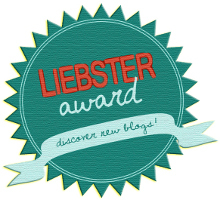 And MY nominees for the Liebster Award are….drum roll please! Crafted by Carrie – what a busy gal she is! Trying to finish up a PhD in Biological Engineering and still she makes time to sew. Beautifully, I might add! Make It Yourself Mom’s Diary – I can’t believe Laura has time to sew at all. A busy mom of 4! Great artistic & fashion sense! Core Couture – Ruth is amazing! She blazed ahead in our Ziggi sewalong and finished a killer leather Ziggi.